Wikimania is such an intensive event, that I spend all my time on the people, the talks and the events themselves. This years Wikimania in Gdansk was no exception; as always it was a magnificent event and there were several new things to be welcomed. My plan is to mention the highlights when the videos get on-line. However, one new thing is the creation of a multi lingual content project, a book with 104 Wikipedia articles about Lech Wałęsa. I am happy that I may use the announcement as a "guest blog". prepared for Wikimania 2010 in Gdańsk, has been published at Wikimedia Commons. the world. Every biography comes from a different language version of Wikipedia. All the text was retrieved at the same moment - On the 1st of March, 2010. The book was prepared by volunteers from the Polish Wikipedia community and the whole book, including the cover, is available under CC-BY-SA 3.0. All the authors are listed on the book's last pages. 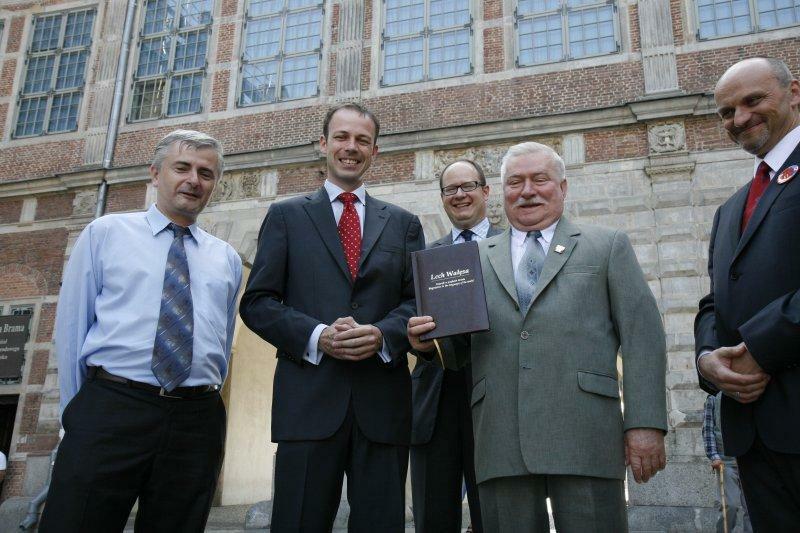 President of Gdańsk, Wikimania organizers and Polish Wikipedians gave Lech Wałęsa the first copy of the book.